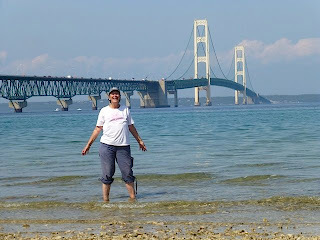 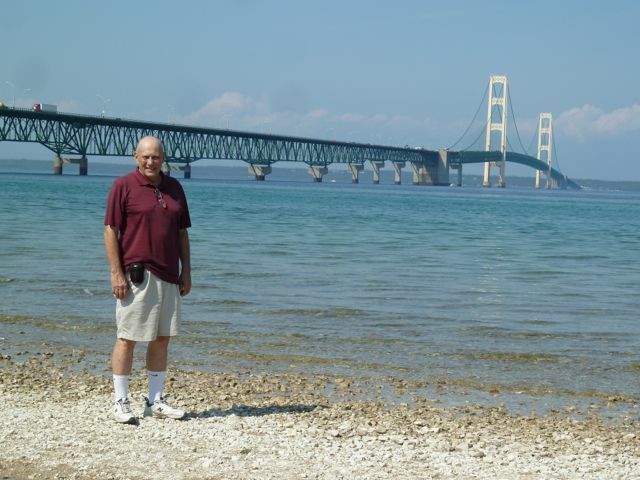 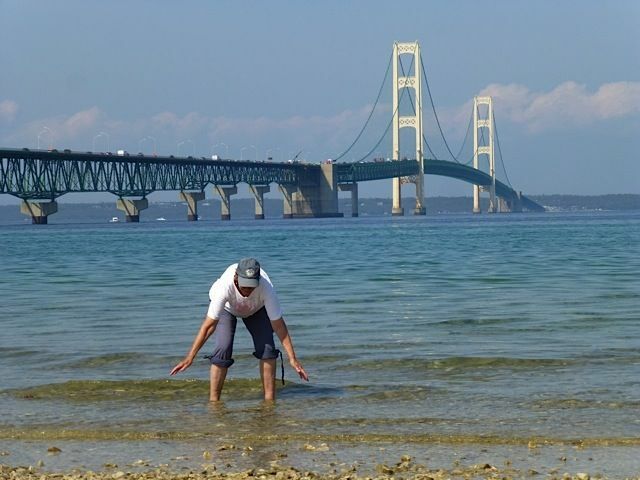 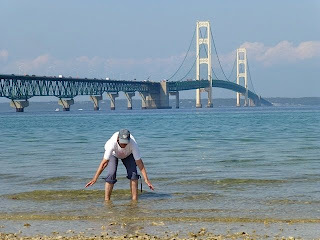 The Malibu was in need of a new set of tires so we drove 20 miles across the bridge to Cheboygan. 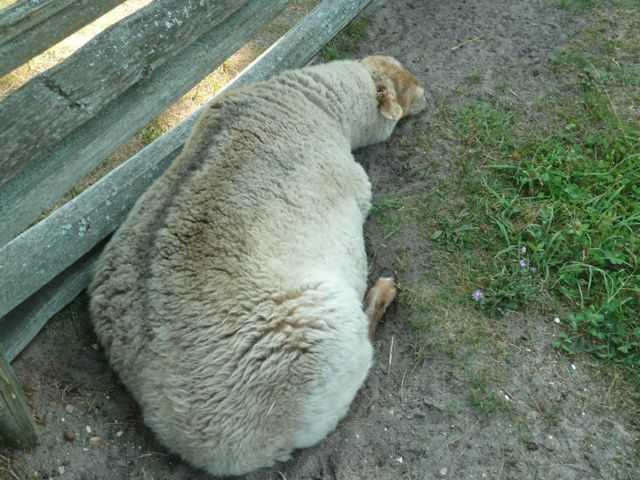 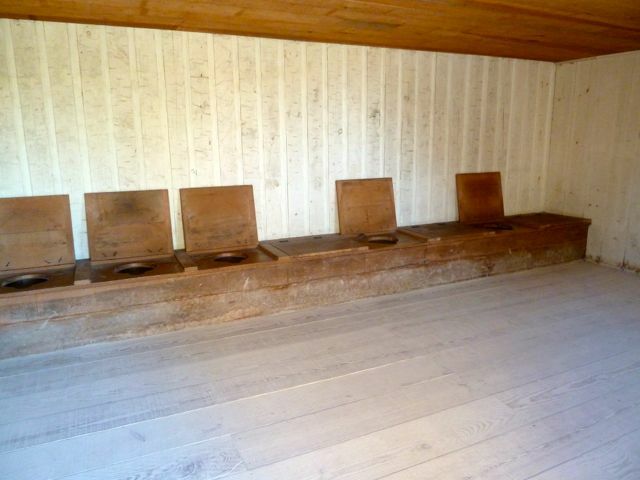 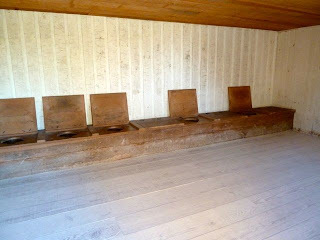 John felt this was the most reputable place. 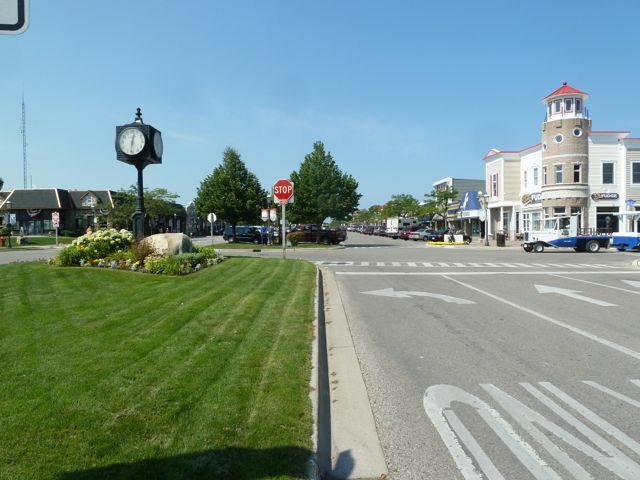 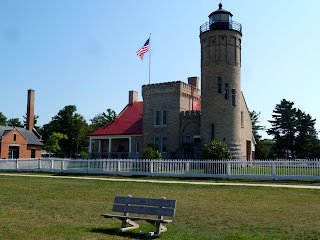 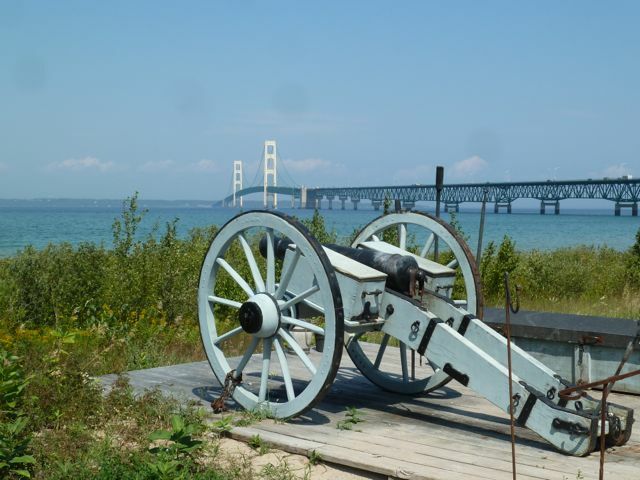 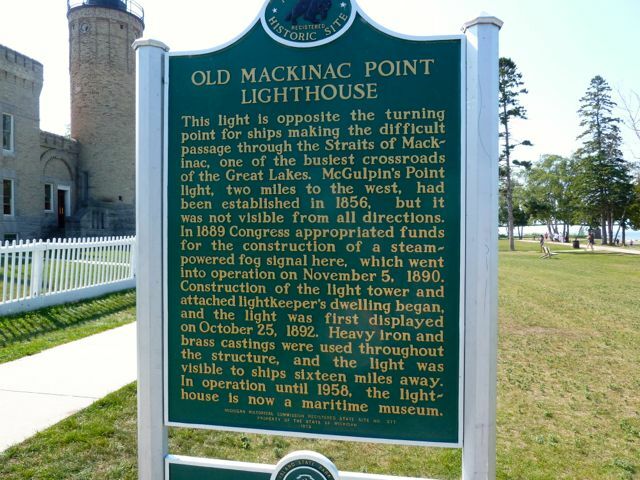 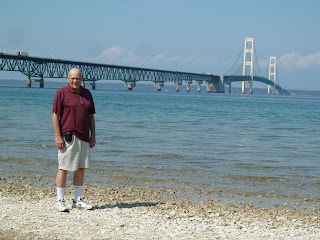 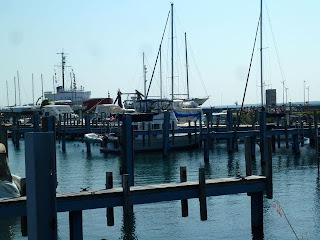 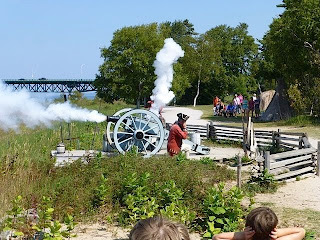 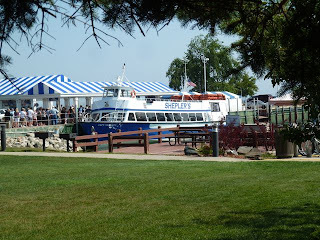 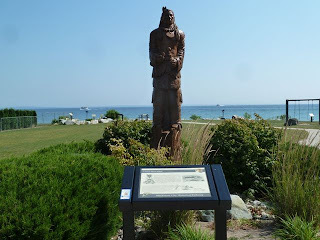 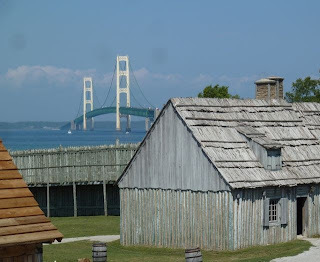 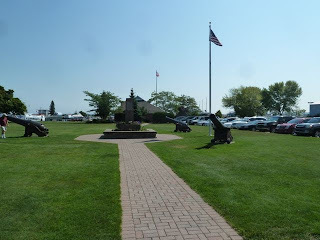 Since we were close to Mackinaw City decided to walk through the town and then visit Fort Michilimackinac under the bridge. 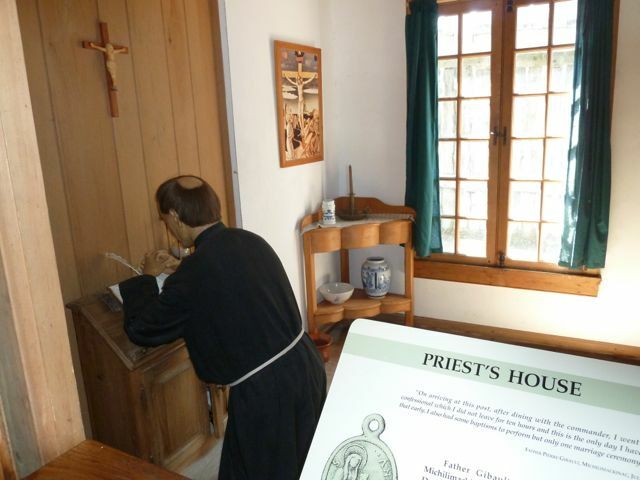 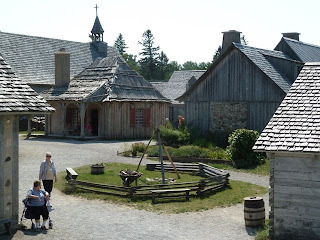 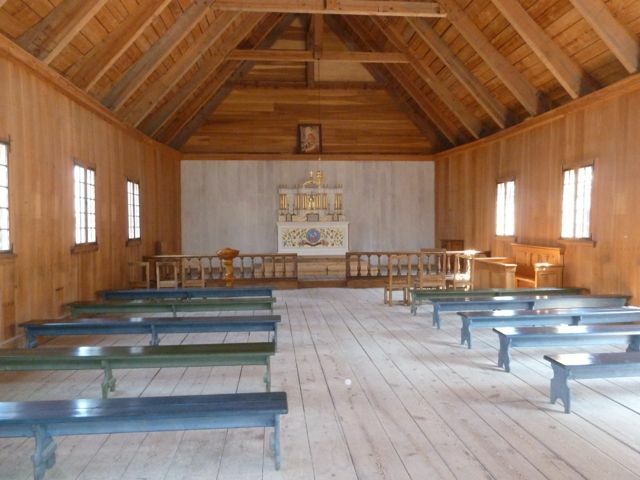 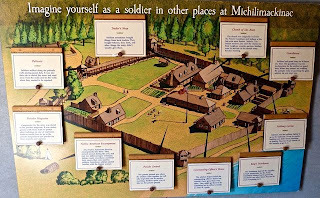 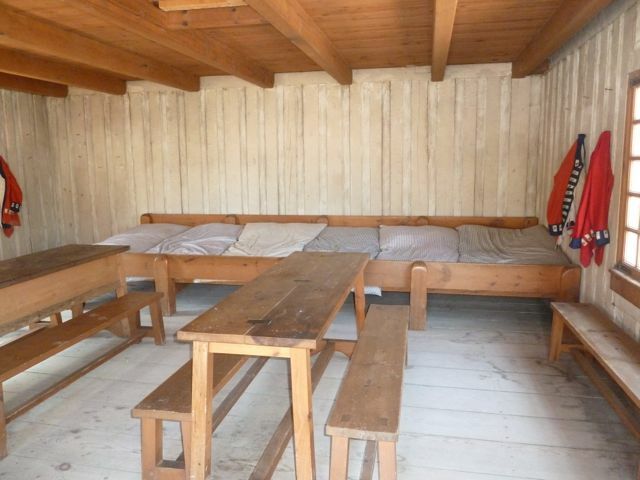 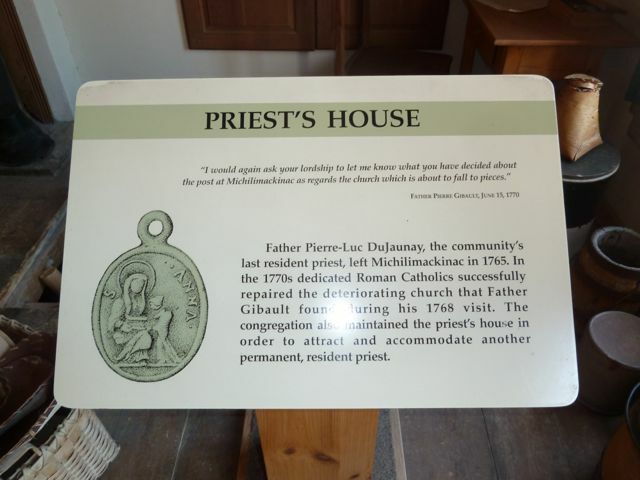 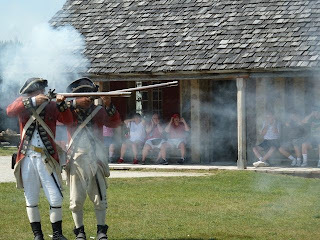 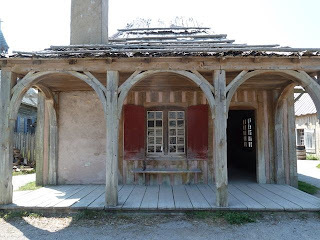 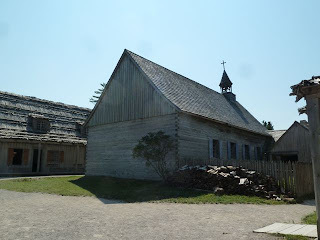 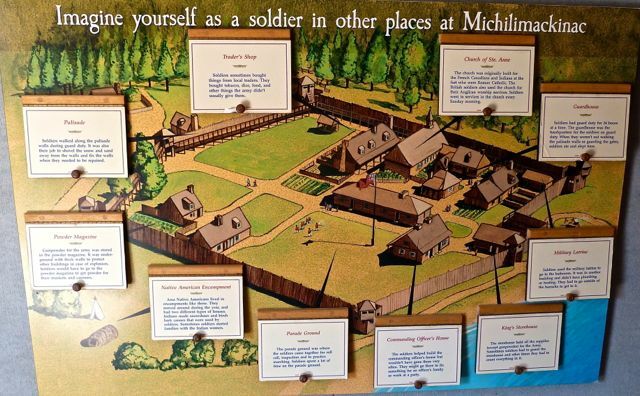 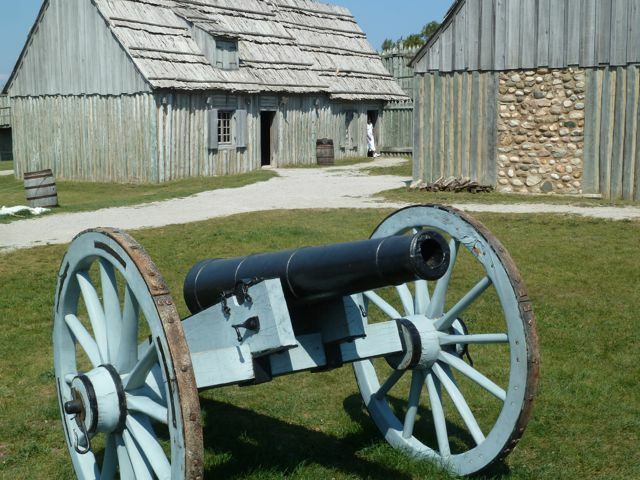 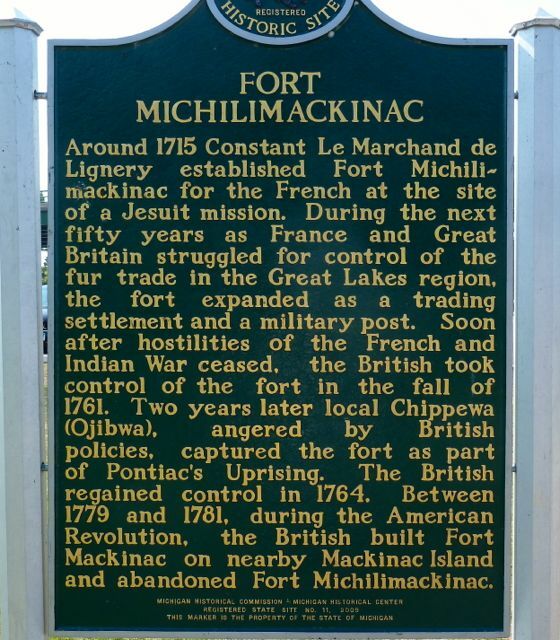 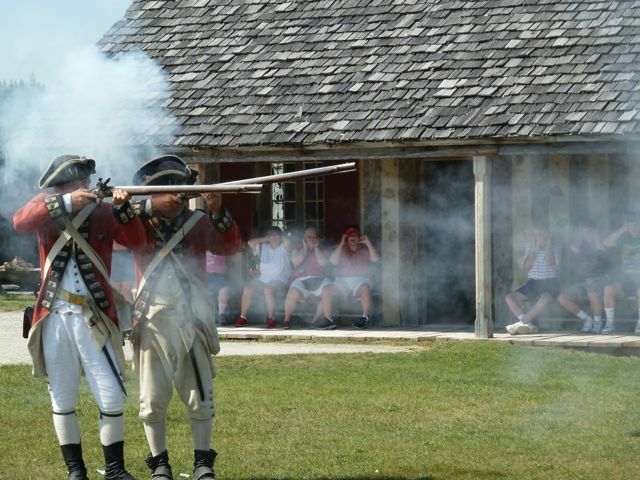 Fort Michilimackinac was established by the French in 1715 at the site of a Jesuit Mission. 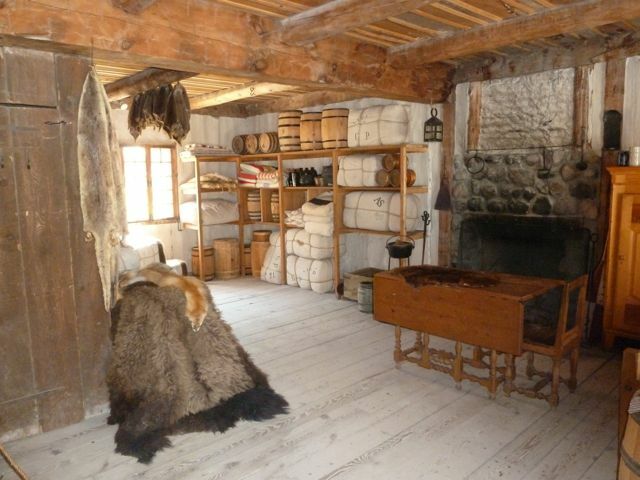 For 50 years the French and English struggled for control of the fur trade in the Great Lakes. British took control of the fort in 1761. During Chief Pontiac's uprising over the treatment of the Indians by the British,the Chippewa captured the fort. 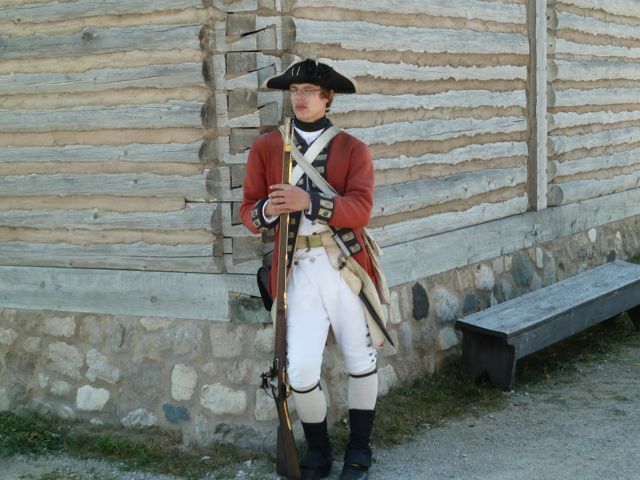 In 1764 the British regained control of the fort. 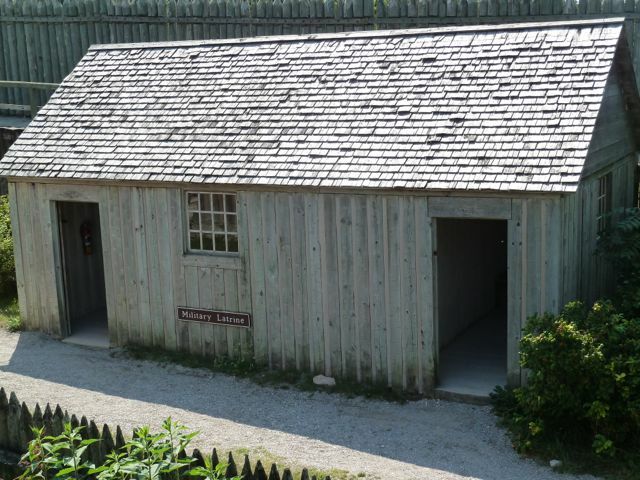 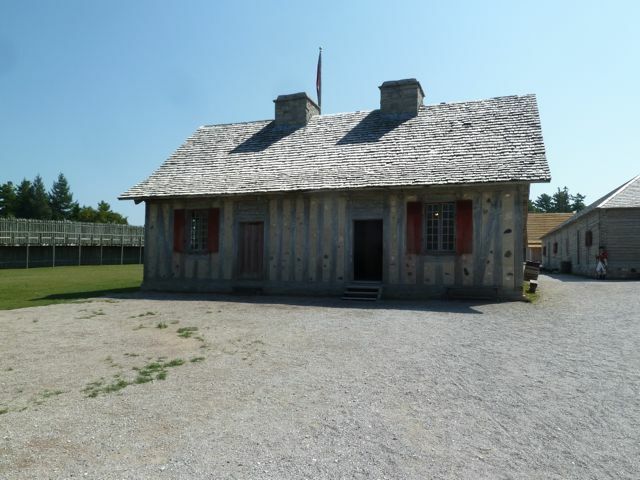 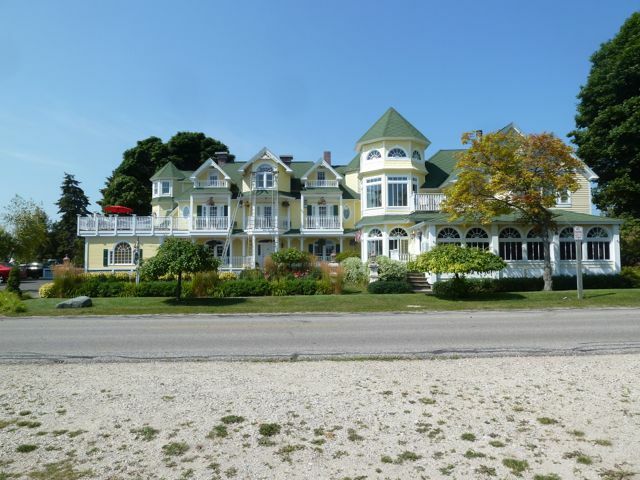 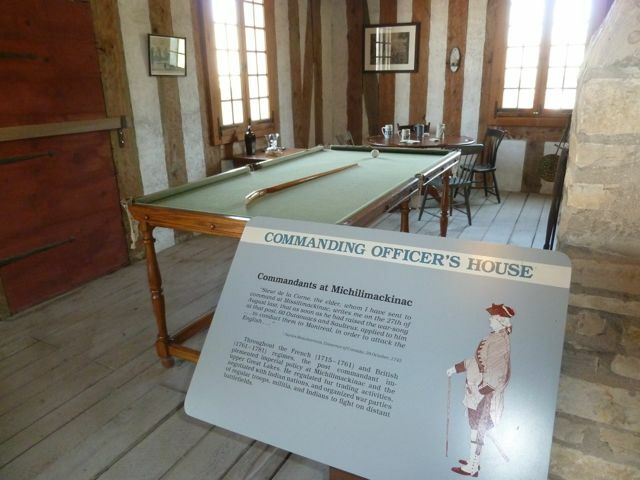 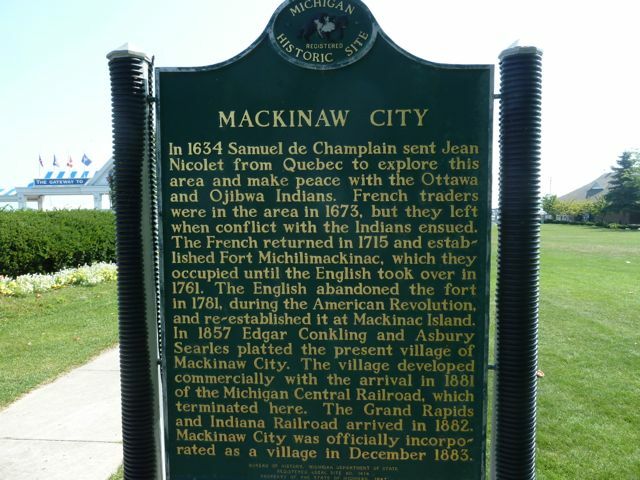 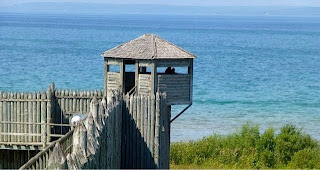 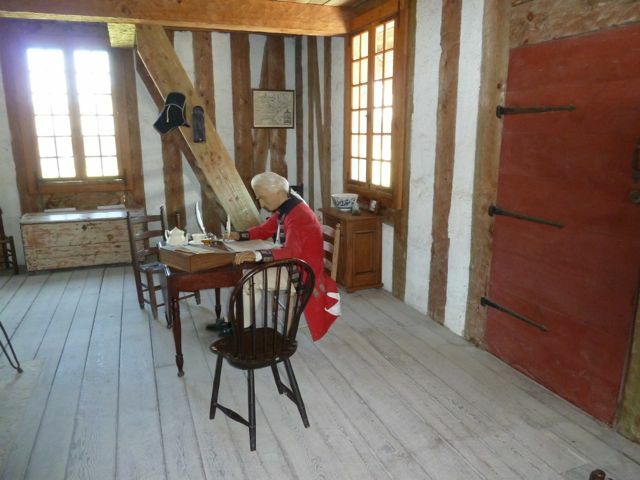 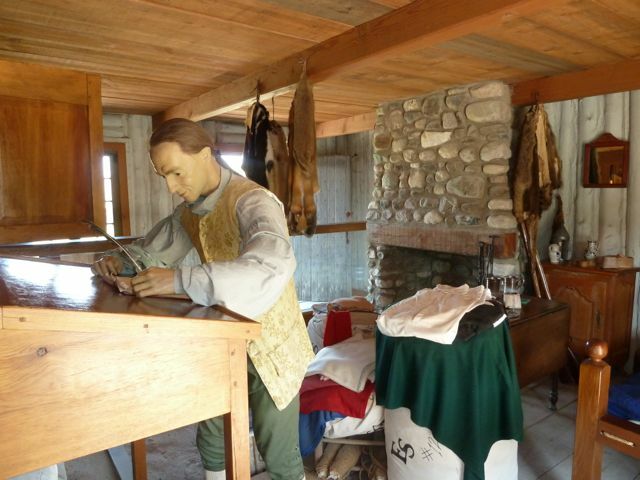 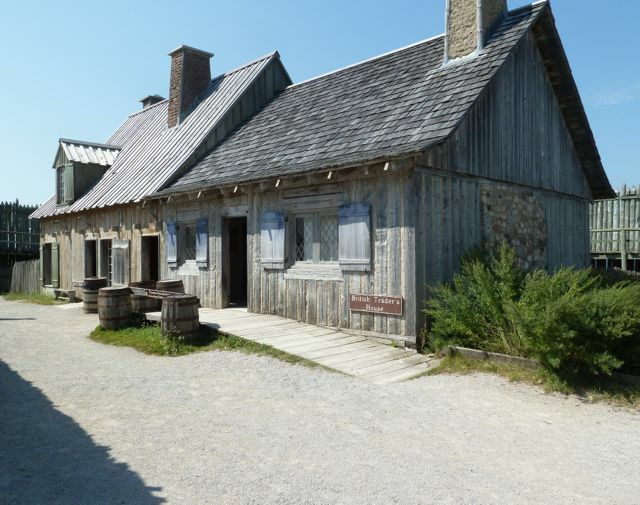 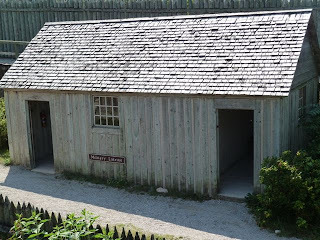 During the American Revolution, Fort Mackinac on the Island was built and Fort Michilimackinac was abandoned. In 1781,the British burned the fort except for a few buildings including Ste Anne Church were moved across the ice to Fort Mackinac. 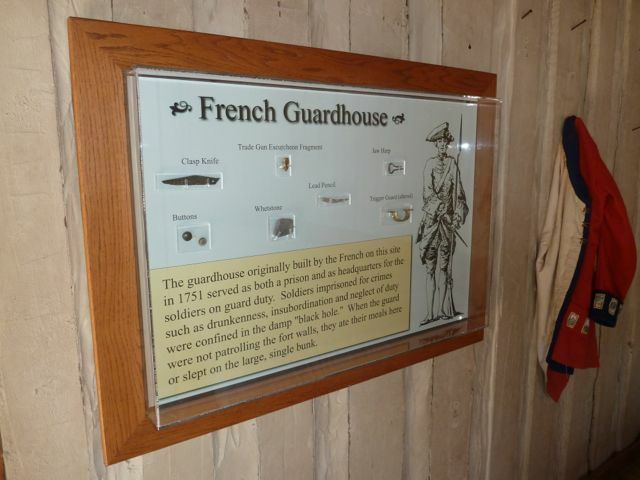 Reconstruction of the fort began in 1959 and archaeology digs are ongoing. 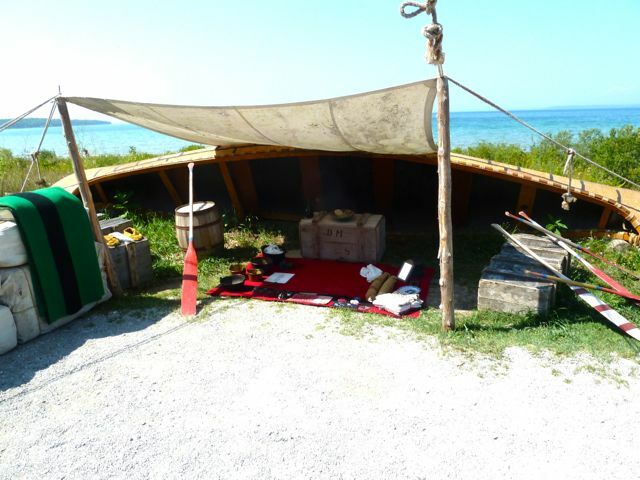 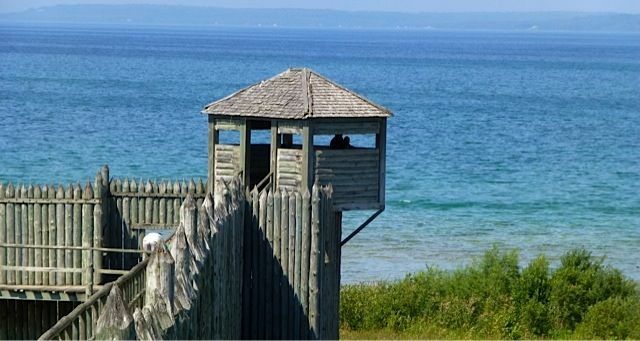 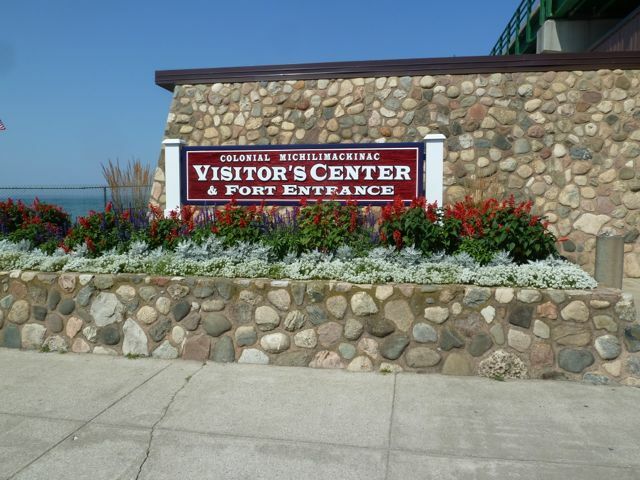 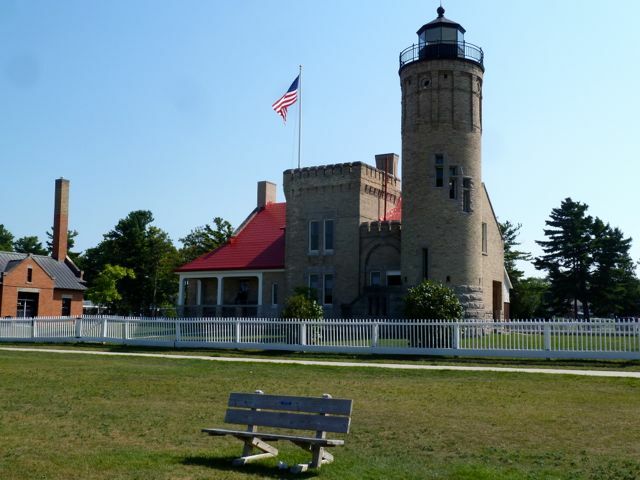 The fort sits to the west of the bridge on Lake Michigan with the visitor center directly under the bridge. 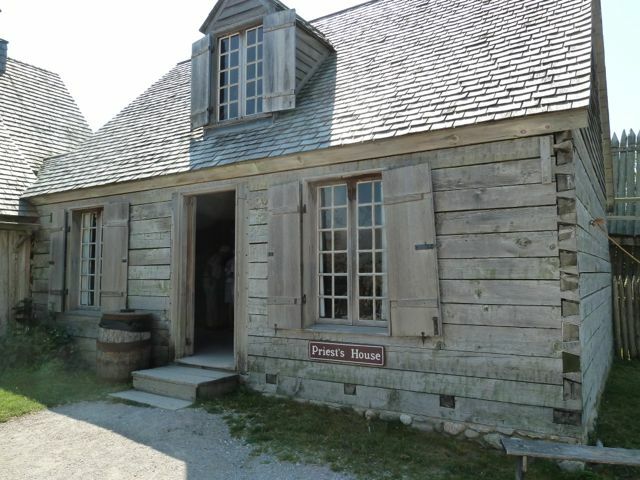 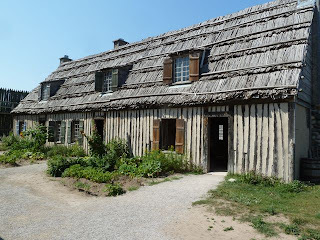 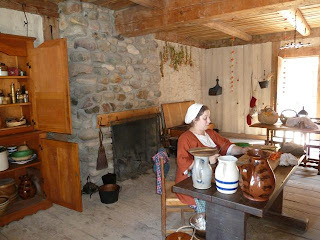 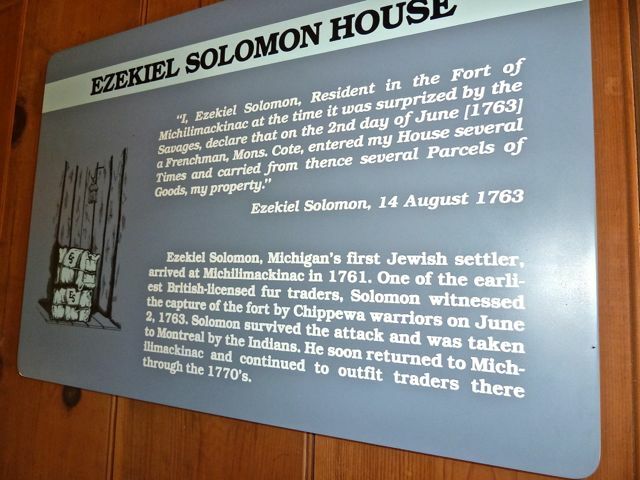 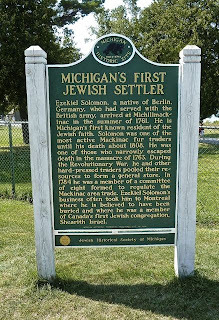 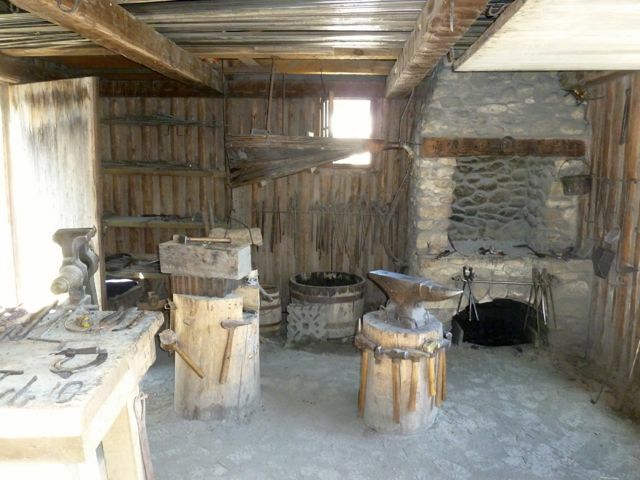 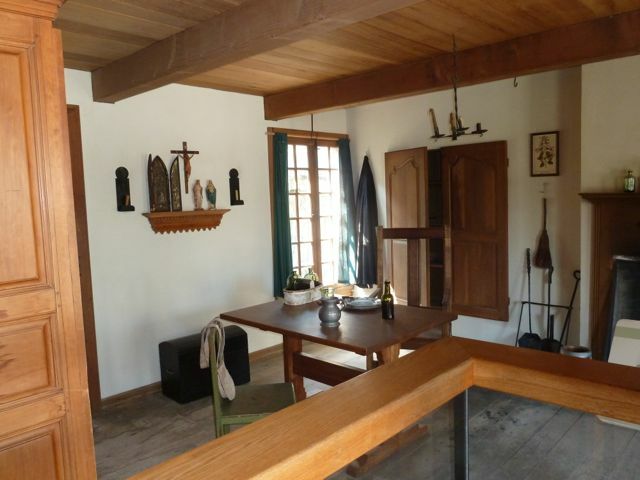 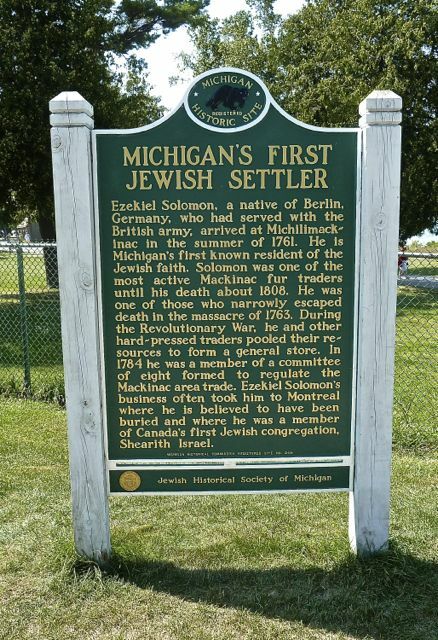 The Ezekiel Soloman House was home to the first Jewish settler in Michigan who served with the British Army. 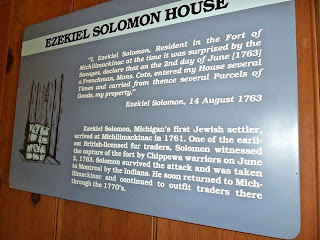 He arrived in 1761 and narrowly escaped death during the Pontiac Uprising. It is believed he is buried in Montreal in 1808. He was very active in the fur trade.